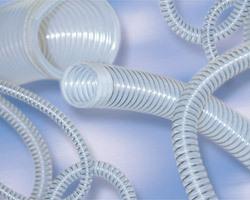 Chemfluor® Con-T™ Convoluted Tubing is a companion to Chemfluor® CT-Flex Corrugated FEP or PFA Tubing. Con-T™ is helically convoluted PTFE with stainless steel reinforcing coil encircling the outer surfaces between the convolutions. PTFE provides the highest available degree of chemical inertness, together with high-temperature operating capability, low wall friction and non-stick qualities. The convoluted form provides much more flexibility than is possible with smooth bore tubing, and the continuous spiral aids self-flushing. The wire coil provides increased pressure and vacuum capability and aids in electrically grounding the system. Barbed inserts are recommended for Con-T™ tubing. Chemfluor® and Con-T™ are trademarks of Saint-Gobain Performance Plastics.